The fun of growing vegetables, flowers, shrubs and trees from seeds and cuttings is so rewarding. But, transplant shock loss can take all the fun out when plants don’t grow or show the same vigor. Plants are designed to stay in one place. They put down roots, deep or wide, and remain there until they die. It is us who move them around. When plants move from one place or area to another, it’s a shock. It’s difficult to watch newly planted plants adjust to the new environment. Sometimes plants die as a result of the move and you can call it death from transplant shock. Plant transplant shock is caused by harm to the plant roots, during the transplanting process. Plant shock happens to seedlings, bedding plants, trees and yes even cannabis plants. While the thickest roots are closest to the root ball, the most important roots… those necessary for the plant to survive and thrive, are farthest from the plant. These minor roots are like thin, tiny hairs which absorb the majority of the water spread throughout the soil away from the plant. Many new gardeners do not consider minimizing the of transplanting shock since they’ve never experienced the loss of a plant dying after transplanting. They see transplanting as a simple task of moving the plant’s location. Some plants cope well with the new environment and landscape, while others may completely die. Minimize plant or tree transplant shock by taking preventative measures. Before buying a new plant, choose the best and healthiest ones. Do not buy (AVOID) any plant that looks like it is experiencing problems, suffering from pests (use a neem oil insecticide spray), fungi, diseases or other issues. This increases the chances of having a successful process as healthy plants are more likely to survive a transplant shock. When you buy a struggling plant and transplant it, you only add stress to an already stressed plant. The beginning of spring or the end of fall are the safest times and provide the best conditions to transplant using almost any technique. Do not attempt any plant transplant on summer days, especially field grown plants. Whether from small pots, seedlings in flats, larger containers or a full-grown tree and shrub, experts recommend to do it in the late afternoon when the sun no longer gives extreme heat and the wind is already calm. When it comes to transplanting container plants, you can do it any time in between freezing and thawing. Container plants transplant easier than trees, seedlings, and shrubs especially if you know the soil and other basics of gardening. NOTE: I always like transplanting potted plants into a well-draining soilless mix. When you dig or move the plants, you will probably have to bother the roots a bit. Minimize the impact as much as possible. Try to keep the root ball intact and don’t shake out the soil when moving the plant. Also, make sure the root ball remains moist. If the root ball becomes totally dry, the roots die and the whole plant dies. As we mentioned earlier, the tiny roots at the farthest end of the root ball are the most necessary ones to the plant’s health and growth. The more roots you bring along when you move the trees or plants, the lesser chance of transplant shock to occur and the more likely it will survive. No matter how careful you are, plants will go through some stress when moved. You cannot prevent some shock occuring! The failure to use proper planting technique, adds more stress to the plant! Make sure you choose a location that fits the plant’s needs and the appropriate depth in the ground. Consider the amount of sun, soil drainage, and quality. Then plant it using proper planting techniques: appropriately deep in the ground, moving gently, etc. Plants need water to survive, so give them plenty of watering immediately after moving. After transplanting, the plant’s root system will experience some “damage” and need to recover. Watering makes a very important step to increase the defense of your plants or trees against transplant shock. Water plants and trees immediately and religiously afterwards, considering their watering needs. A cactus, will not need water nearly as often as an almond tree, for example. Except with tomato plants. Don’t trim the top growth of the plant if you’re transplanting tomato plant seedlings. However, if a shrub is being moved, normally, I would remove about a 1/3 of the foliage. Removing the extra foliage reduces stress, loss of moisture and the additional “resources” the plant needs to recover. Follow correct root pruning steps for plants and trees to transition with higher success rate. Once transplanted and properly watered, encourage plant root development with a root booster fertilizer or use an Epsom salt transplant solution. To help a newly transplanted plant, remove any dead parts like dried leaves, branches, or stems. Sometimes newly transplanted material is attacked by pests and insects. A plant in shock doesn’t need the extra stress bugs deliver. Keep a careful eye on your transplanted plants, be ready to adjust and to help get your plants off to a good start in its new location. 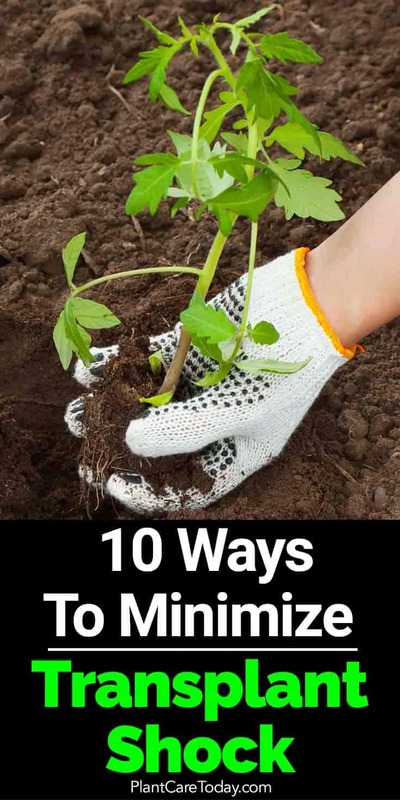 With these ten methods, your plants will be on their way to less transplant shock and keep the “fun” in growing!